Martikyan Music Center is currently offering free trial/ piano lessons & special private lesson packages for children ages 7 and up & adults ages 18 and up. Group lessons are also available for children ages 6-9 & 9-12. Students are encouraged to take advantage of this limited-time offer. Mr. Martikyan uses distinct teaching methods for children and adult students, tailoring their education to their abilities and personal goals. Private piano lessons will cover music theory/harmony, sight reading and students will learn to play their favorite songs in various musical genres such as jazz, classical, pop blues, & more. In group lessons, children will learn about the fundamentals of music such a notation, rhythm, melody, harmony. etc. For more information please email or call at bottom number! Group lessons (2-5 students) Ages 6-9 & 9-12. Students referrals = ONE FREE GROUP LESSON (only when your friend signs up for class) Family discount: 10% tuition discount for 2nd family member 20% discount for 3rd family member. Tuition must be paid in full (MAX) one week prior to scheduled lessons should student decide to enroll in a lesson. On-going registration is available anytime There is a $25.00 non-refundable registration fee due with your tuition. For more information about lessons please contact us at the bottom of this page. Not too long ago, in February 2015, Tigran Martikyan had a vision to build his own Music Institution, now called Martikyan Music Center! After one year of hard work, Mr. Martikyan was able to build his sophisticated, small theatre-like venue featuring custom designed furnishings, wall installation-scluptor, and more–all selected and designed by Mr. Martikyan himself. Since May 2016, Martikyan Music Center has opened its doors to the public and has been garnering much attention in the Pasadena community as well as nearby cities in California! Martikyan Music Center offers the best music instruction in piano. Piano lessons are offered and tailored based on your musical background and knowledge. Mr. Martikyan guides you through the creative musical journey in order to achieve the best results in your music! Without any doubt, your musical dreams come true at Martikyan Music Center! Throughout the years, Mr. Martikyan has developed a unique vision and instructional philosophy that benefits students greatly, whether taught privately or in groups. Tigran Martikyan has worked with students ages seven to 65, with the firm belief that all students have the ability to master a musical talent. Mr. Martikyan believes the most essential part of teaching is to create a personal and encouraging relationship with each student, ensuring they learn the material adequately and properly at their own pace. Using his unique teaching tools such as the Music Castle and the Baby Grand Piano Puzzle, along with his interactive game activities, Tigran Martikyan seeks to make musical education fun and inspirational. Mr. Martikyan also uses distinct teaching methods for adult students, tailoring their education to their abilities and personal goals. One of the top priorities at Martikyan Music Center is to provide students with private piano lessons in classical, jazz, pop, blues, etc. 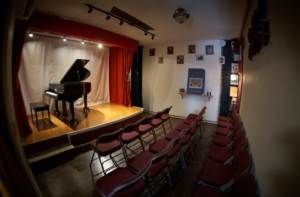 In addition, the center hosts small piano recitals/concerts performed by its students and features instructor performances. Music Center is now expanding its music program offerings to provide piano group instruction, individual lessons in violin, cello, guitar, woodwind, etc., and special musical performances by other artists. In addition to lessons and concerts, Martikyan Music Center will soon be holding music-related lectures, workshops, film screening, poetry readings, plays, etc. Tigran Martikyan is a pianist, composer and creative individual who has been teaching music for almost 25 years. Mr. Martikyan earned his Bachelor of Music in Jazz studies from the USC Thornton School of Music in 1998 and his Master of Music from the Manhattan Conservatory in 2000. Mr. Martikyan has taught hundreds of students of many different backgrounds and organized dozens of music workshops in Los Angeles and New York. In addition to teaching, Martikyan is also a versatile composer and an active performer. He extends his repertory beyond his beloved jazz; composing classical pieces as well as music for motion pictures and choreographies. Tigran’s music has garnered the attention of celebrities such as Kelly Ripa, Grace Hightower, Chick Korea, Horace Silver and many well-known figures in the music, film, and TV industry. Mr. Martikyan has given concerts throughout Europe and the U.S., including one at Carnegie Hall, where his “Piano Sextet” was performed as a World Premiere.